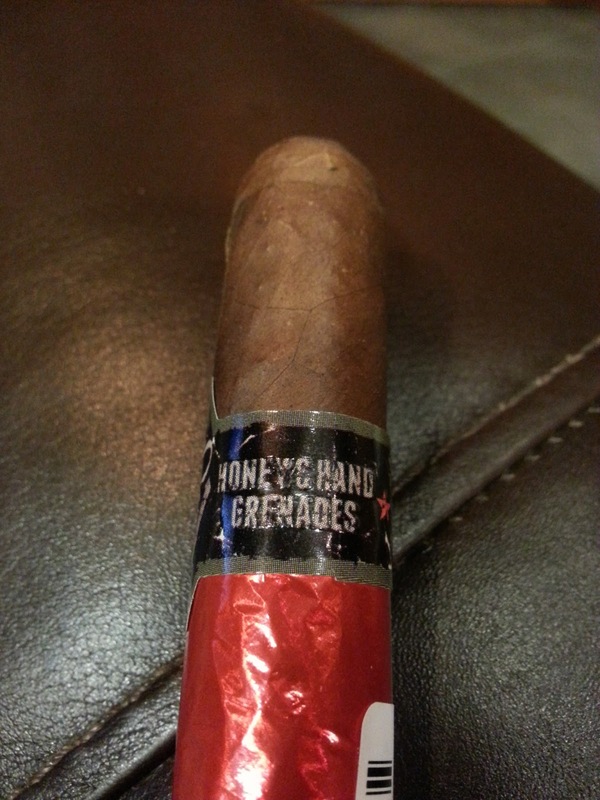 Appearance (0-20): The Viaje Honey and Hand Gernades (HHG) is really tough to miss. With a rich red foil wrapper encasing the cigar, it immediately draws the eye to this stick. But along the top of the foil area is a band that sports an almost industrial symbol (something like a biohazard sign) with a bee at its center, however the body of the bee is a hand grenade. Turning the band, you find the name on its side, “Honey & Hand Gernades”. 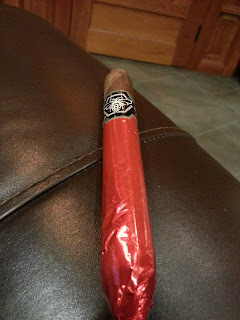 Upon removing the foil, you are greeted with a nice deep Criollo wrapper that is in perfect condition. The shape is a bit different, with a rounded cap… but a pointed foot instead. No veins of note at all on this one, either. From top to bottom, the HHG looks amazing. Construction (0-20): From an initial feel standpoint, there is nothing to worry about with the HHG. 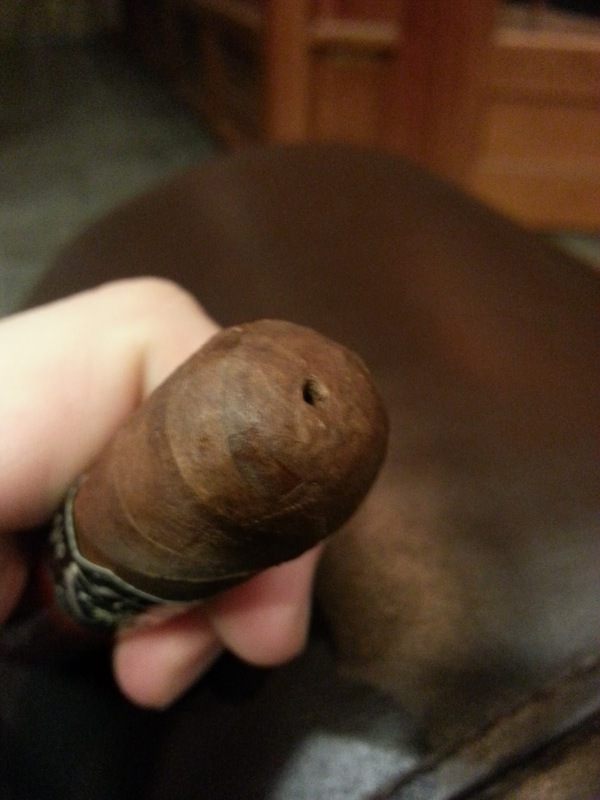 The cigar has a very solid feel when pertaining to the tobacco inside it, but it has almost a spongy consistency. The wrapper feels extremely silky and to be honest… it really is gorgeous. There is a pinhole in the cap (that I have heard people question multiple times). It kind of fits the whole mystique of the honeybee aspect of things, as if this was just one of the stings from it. This, of course, isn’t the first time that Viaje has used the pinhole approach. It serves a dual purpose – it helps the tobaccos to dry as well as allowing you to use that instead of cutting the cigar. With that in mind, I lit up this stogie using the pinhole. The HHG lit up easily and burned decently evenly throughout. The draw was surprisingly good for just the pinhole approach. 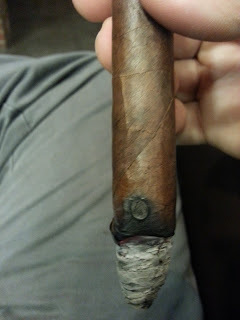 The only mishap occurred within the first 2 inches where the cigar burned a bit hot up the wrapper. 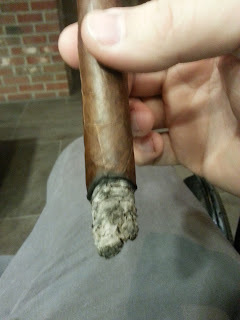 Aside from that, the construction was spot on and it held the ash for 2+ inches at a time. Strength (0-20): Medium to Full. I found this to begin at the lower end of the medium spectrum, and it slowly builds up to where it hits the full range… though not until the final third. It hits its intended mark. 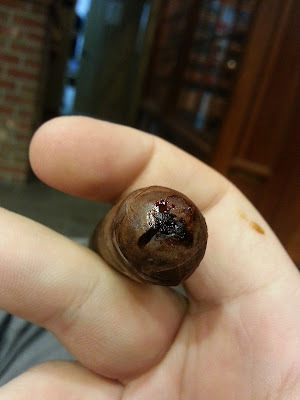 Flavor (0-20): Dark chocolate and wood dominate the first third of the cigar with pepper on the retrohale. There is a little bit of other spice to note, but it’s just a backdrop to the others. There’s also a very fresh blast of flavor that I couldn’t quite put my finger on to begin with, but as it progressed it became a floral element. There’s a twist of a bit of bitterness, much like you get with a strong coffee. The HHG balances nicely with the sweet chocolate and bitter flavors coming through. In addition to all of that, there are hints of leather and some other hefty tobacco tones. The final third continues with the same flavors, though it is much sweeter and absolutely much stronger. The blend has a nice amount of complexity with a balance between bitter and sweet. One major thing to note before I close out the flavor section… I chose to smoke this using the pinhole. At around the halfway point, I began to get a really bitter taste. I knew something was up, but continued to give it a moment to pan out. It didn’t. IT was easy to recognize the issue since I am also a pipe smoker – the taste of tar. Taking a look at the cap, you can see that the small airway path actually clogged the tar’s normal path, resulting in a really offensive taste. 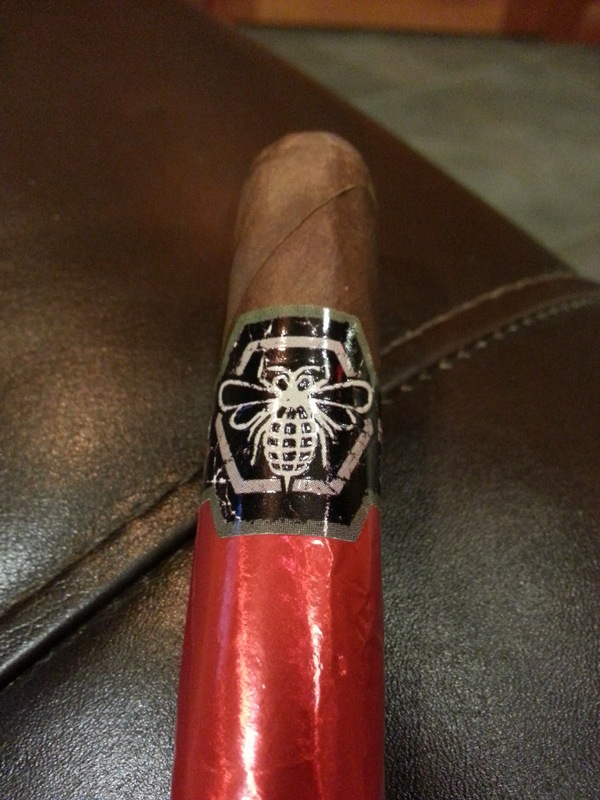 My recommendation – snip the cigar. As such, I’m giving this flavor area two separate scores – one for the pinhole approach, and one for a normal cut. Value (0-20): The novelty of the Viaje HHG may be enough to warrant spending the $11.00, but once you get past it – it’s worth the price. Overall (0-100): This cigar is getting two distinct scores, due to the pinhole versus normal cut debate. But regardless of that score differential, you will find this to be both an interesting and engaging cigar. The appearance is enough you have you wondering what it has up its sleeve, but the tastes will be enough to keep you enjoying it. The bitter coffee taste is balanced by the sweetness of a dark chocolate, with supporting undertones of wood, something floral, and some decent pepper spikes. The construction is superb, minus of course the question of the pinhole. And the price is right on the money for something with a limited run, a great look, and really well woven tastes. If you are looking for a recommendation – go with the normal cut score (and cut it, trust me, its worth it). Damn that is a ton of tar. Havent had and Viaje in a long time. The flavors of this one sound pretty good. 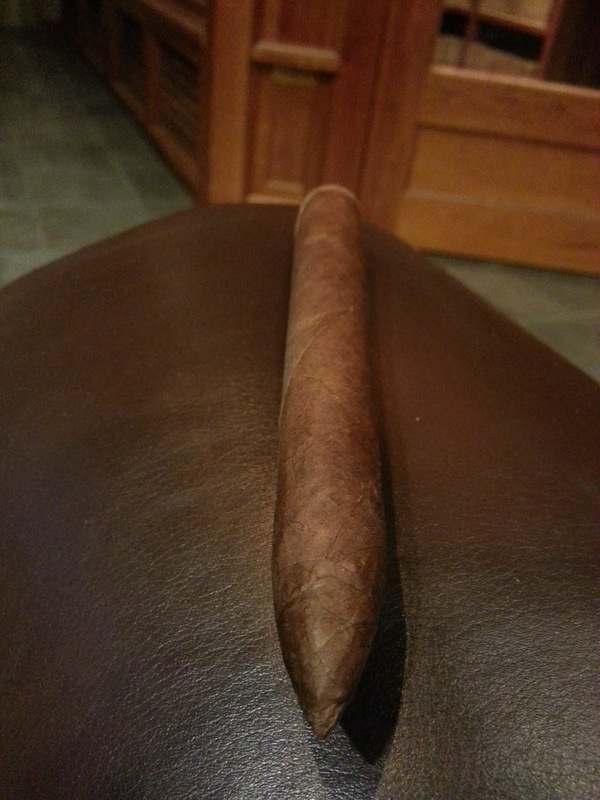 It was honestly an awesome cigar. Im planning on picking up another one soon to smoke again.